Edwardian fashion refers to the clothing that was in style between the late 1890s and 1914 or the beginning of the Great War (World War I). Also called La Belle Epoque (the Beautiful Era), and the Gilded Age, this was a time when women's fashions took on a new opulence and extravagance, inspired by the hedonistic lifestyle of Britain's King Edward VII. The design trends of the Edwardian era revolved around the S curve when corsets created an S shaped female silhouette, a change from the Victorian hourglass figure. The S bend corset forced the hips back and bust forward. The ideal female figure was a mature woman with a pigeon shaped monobosom. After the death of the highly influential Queen Victoria in 1901, her son Edward rose to the throne. Edward VII had, until recently, the distinction of being the longest serving Prince of Wales (59 years) and spent much of his attention on his lavish life style. Edward is rumored to have had 55 love affairs, including romantic liaisons with famous actresses Lillie Langtry and Sarah Bernhardt. By the late 1890s, the Industrial Revolution had created new technologies that changed the way people lived. The growth of factories spawned a large middle class as large corporations generated new wealth and an upwardly mobile middle class. Sewing machines enabled the production of ready made clothing and made it easier for women to sew their own clothes. An increased literacy in the new middle class gave women access to information. The inventions of the typewriter, telephone, and telegraph offered women increased employment opportunities when previously, women's jobs were restricted to domestic servitude or factory work. Despite the fact that a large majority of working women labored long hours for low pay in dimly lit, poorly ventilated factories and mills, a new kind of women was beginning to emerge. The new women of the early 1900s was educated and informed, with an interest in politics and social causes. The opposing concepts of an educated middle class woman who was active and outgoing contrasted with the urge toward luxury and hedonism to create the culture we call Edwardian. All fashion eras have their archetypes. 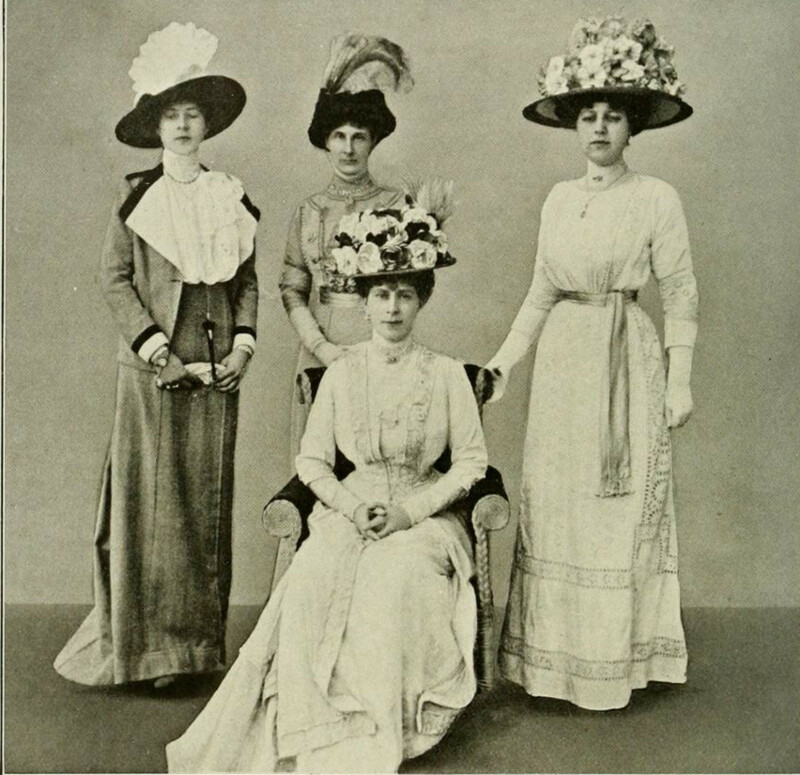 Edwardian trendsetters included the Gibson Girl and Alice Roosevelt Longworth. 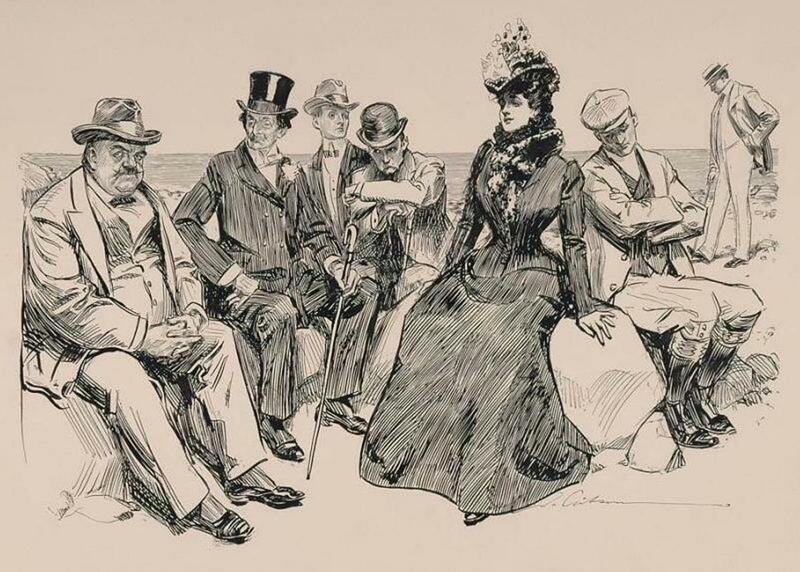 The Gibson Girl was a fictitious, unnamed character portrayed in the illustrations of Charles Dana Gibson who created what would become the feminine ideal for 20 years. The Gibson Girl was shown as youthful and strong, fun loving, yet sophisticated. She was tall and slender with a long neck, ample bust and hips, and a small waist. Her upswept bouffant hairdo was all the rage and her aristocratic bearing inspired young women everywhere. The Gibson Girl was smart and independent, charming, and intelligent but was never shown to be political or interested in social causes. 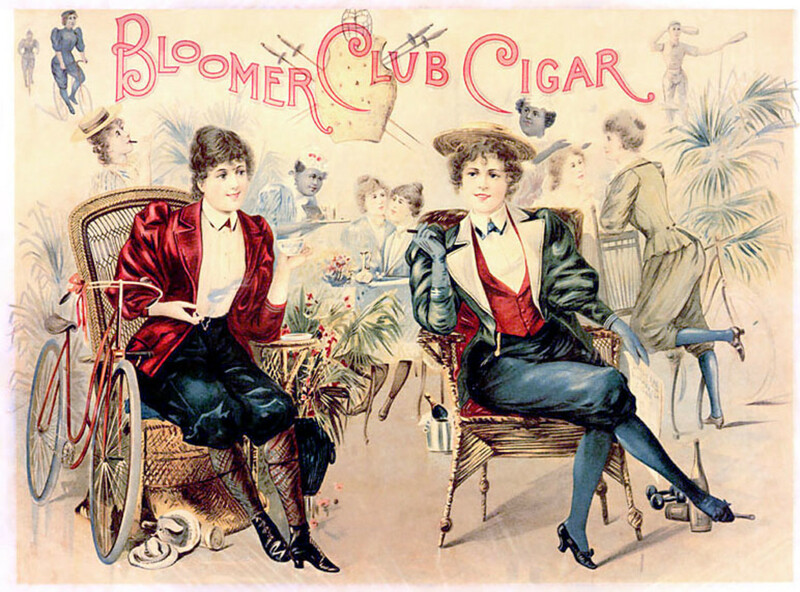 The Gibson Girl became a merchandising bonanza. Her face and form were depicted on trays, on prints, pillow cases, souvenirs, and ashtrays. 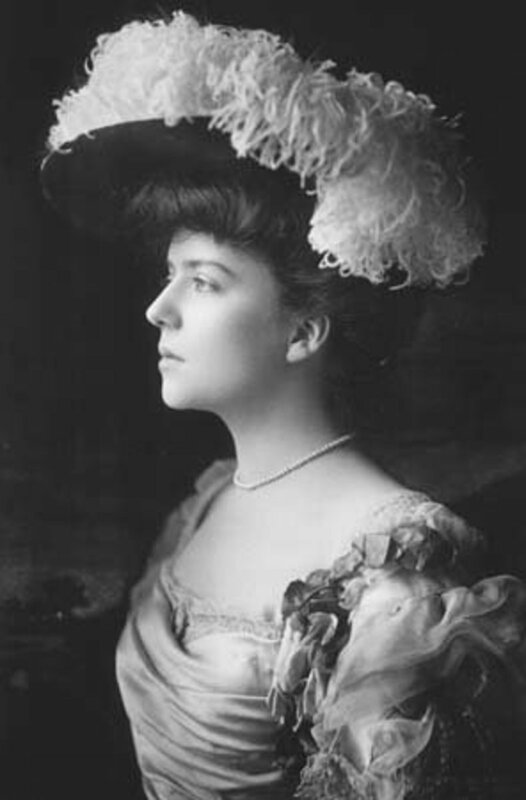 Alice Roosevelt Longworth, the eldest daughter of Theodore Roosevelt was a high profile society figure in the USA. Beautiful and outspoken, Alice rode in cars with men, smoked, and kept a pet snake. The song 'Alice Blue Gown,' referred to the popular shade called Alice Blue named after her eyes - light blue with a hint of gray. Her father, the President of the United States once said, "Either I can run the country or tend to Alice but I can't possibly do both." As the century changed so changed clothing design trends. Gone was the bustle (a pad at the rear end) and heavy fabrics.of the previous century. A new, lighthearted concept overtook women's fashions along with a sentiment of eternal summer with dresses made of light weight fabrics for a more active lifestyle. The 2 pieces dress came into vogue. Skirts hung tight at the hips and flared at the hem, creating a trumpet or lily-like shape. Skirts in 1901 had decorated hems with ruffles of fabric and lace. Some dresses and skirts featured trains. Tailored jackets, first introduced in 1880, increased in popularity and by 1900 tailored suits became hugely popular. By 1904 skirts became fuller and less clingy. 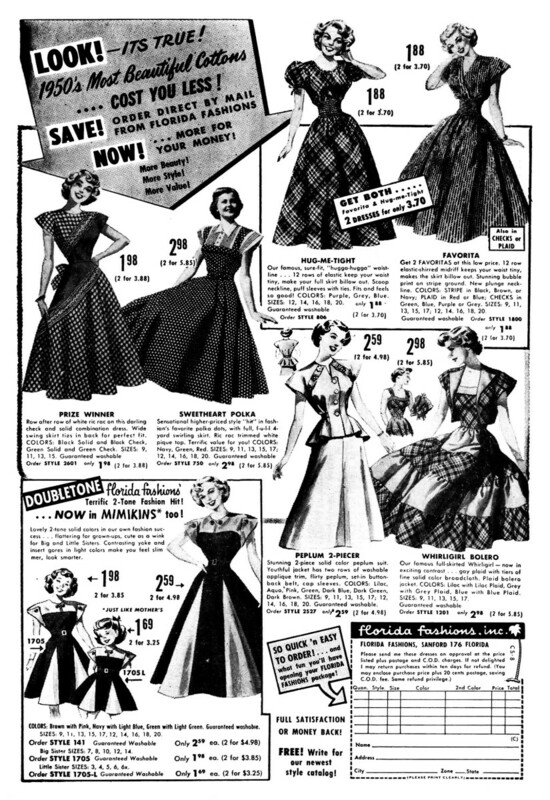 In 1905 skirts fell in soft folds that curved in, then flared out near the hemlines. From 1905 - 1907 waistlines rose. 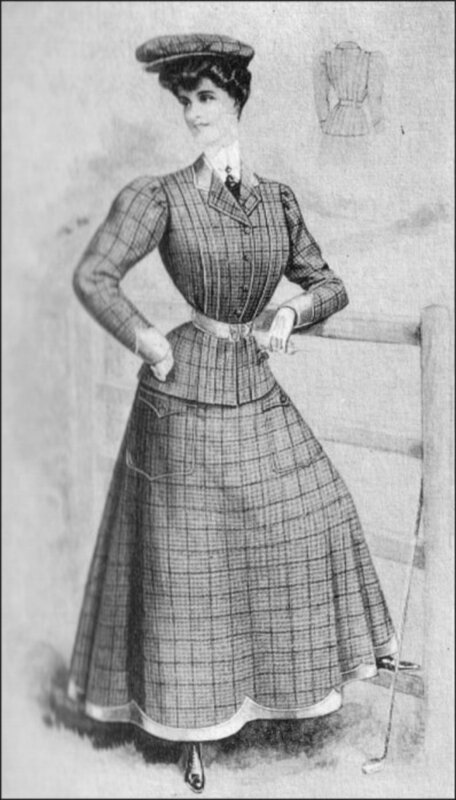 In 1910 the hobble skirt was introduced; a tight fitting skirt that restricted a woman's stride. Lingerie dresses, or tea gowns made of soft fabrics, festooned with ruffles and lace were worn indoors. The blouses and bodices of the Edwardian period were embellished with pieces of lace and bead work, and lines of ruffles. In the late 1890s, bodices were bloused with a pouched effect. Corsets gave women a monobosom - the corset did not divide the bust but rendered a pigeon-like look. By 1904 blousing spread to the sides of the bodice. Blouses, or bodices, featured high necks in light fabrics or lace. 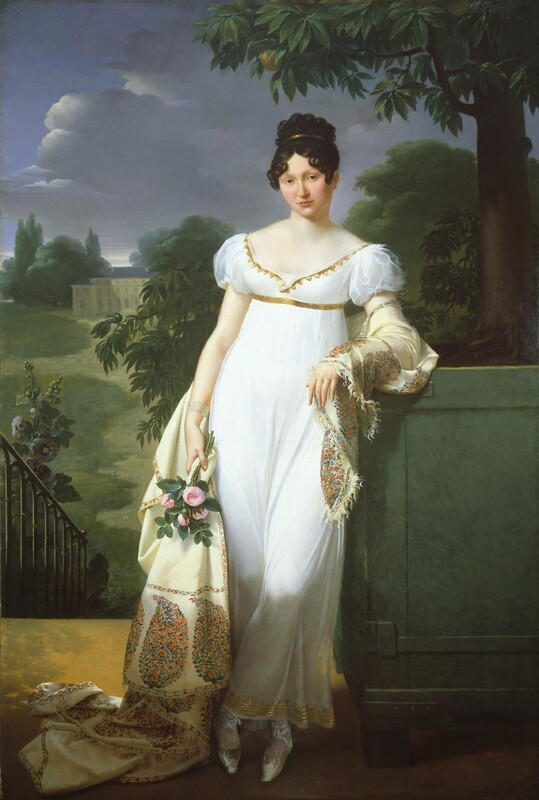 Evening wear bodices showed more skin with sweet heart, round, or square necklines. Early Edwardian sleeves fit tightly at the top of the arm, filled toward the lower end and gathered into a tight cuff. 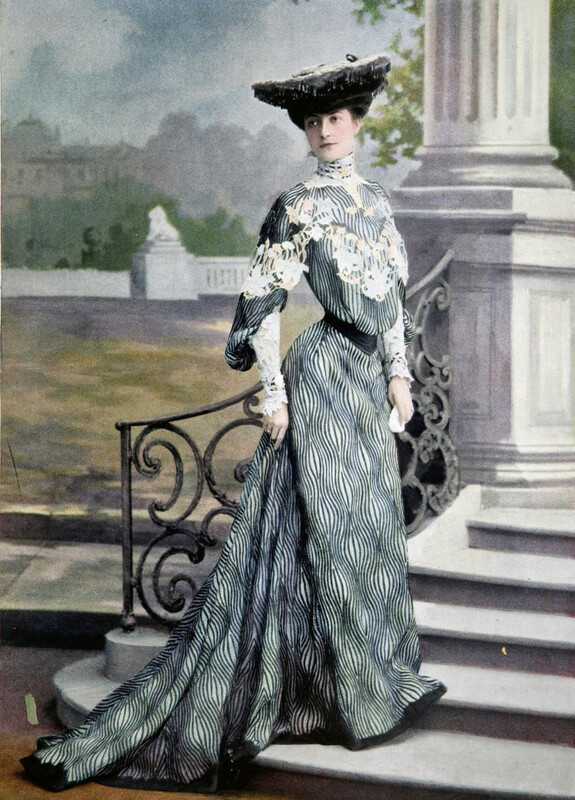 1900 - 1905 Edwardian fashion trended toward open end pagoda sleeves. By 1905 fullness at the wrist was gone and sleeves were wide and full at the top. Sleeves stayed full at the top through 1909. They narrowed below the elbow and fit snuggly at the wrist in a style often called Leg of Muttun. In 1910 the kimono sleeve was open, loose, and comfortable. The lace-up boots of the late 1800s continued on into Edwardian footwear. Better shoes and boots were made of sealskin and were thin, durable, and nearly waterproof. Expensive sealskin was thin, comfortable, and insulating for both hot and cold weather. Lesser priced shoes and boots made of tooled Moroccan leather were stiff, hot, and heavy. Kid boots and shoes were a lesser quality footwear that did not maintain their shape. The Great War created a leather shortage and saw the introduction of cloth topped shoes and boots, functional footwear that appeared mostly in black. Wide brimmed hats were trimmed in feathers that often extended beyond the hat brim. By 1911, smaller hats still used a lot of feathers taken from the breeding plumage of wading birds created in factories called Plumassiers. When the Audubon Society informed the public of the dire threat to the American bird population and the decline of wading birds due to the heavy demand for feathers, women responded in shock. Commerce in feathers ceased abruptly, leaving warehouses full of feathers. Some of these factories and warehouses caught fire and burned when unscrupulous businessmen sought to recoup loses through insurance. 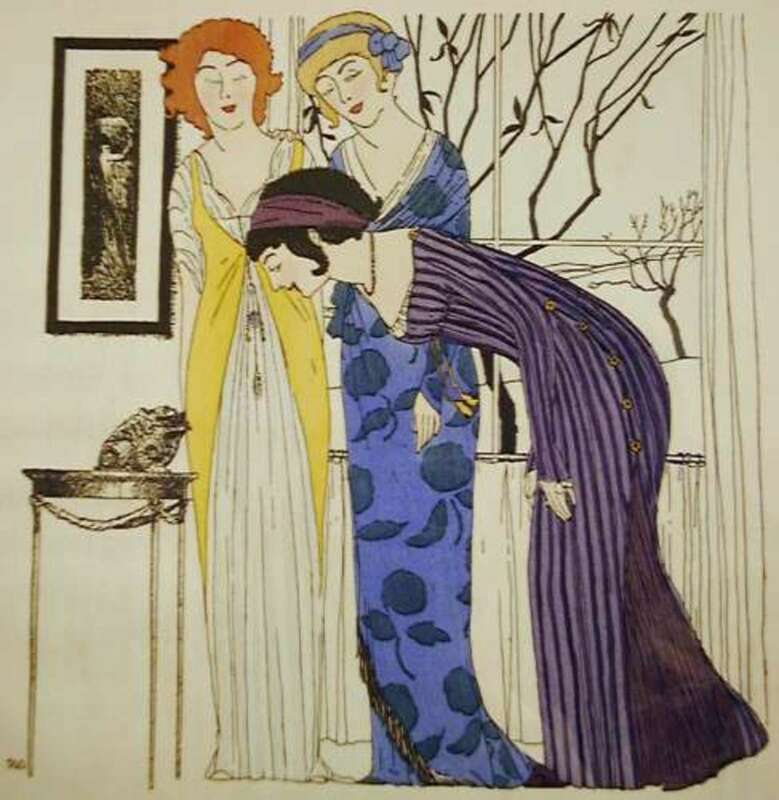 Ladies' Edwardian fashion was greatly influenced by the designer Paul Poiret, known as the creator of modern clothing shapes and designs. 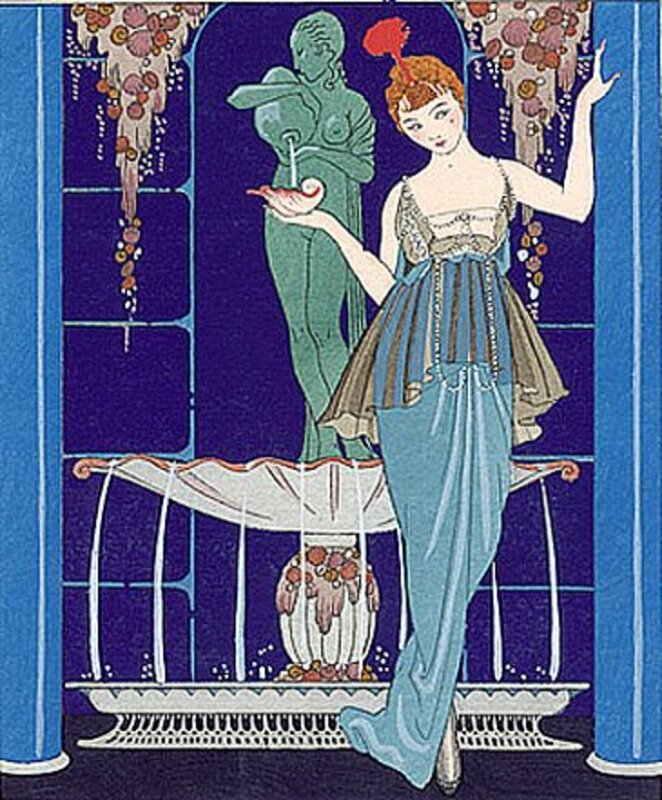 His clothing designs were inspired by art including classicism, Orientalism, and Art Nouveau. Poiret's comfortable styles freed women from the constriction of corsets and relied on draping for effect. In 1908, he introduced the straight tube sheath dress. 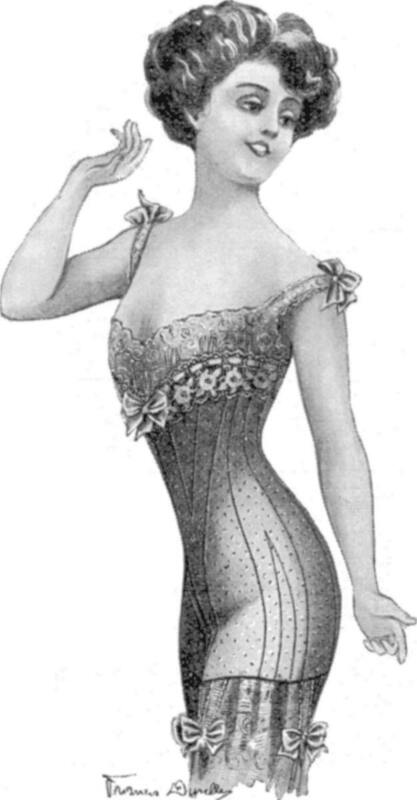 Women abandoned the S corset for longer, straighter corsets and bras. His Oriental style became popular after the Ballet Russes performed Scheherazade in Paris in 1910. Fashion concepts included exotic designs based on harem wear in bright colors with beaded embellishment. 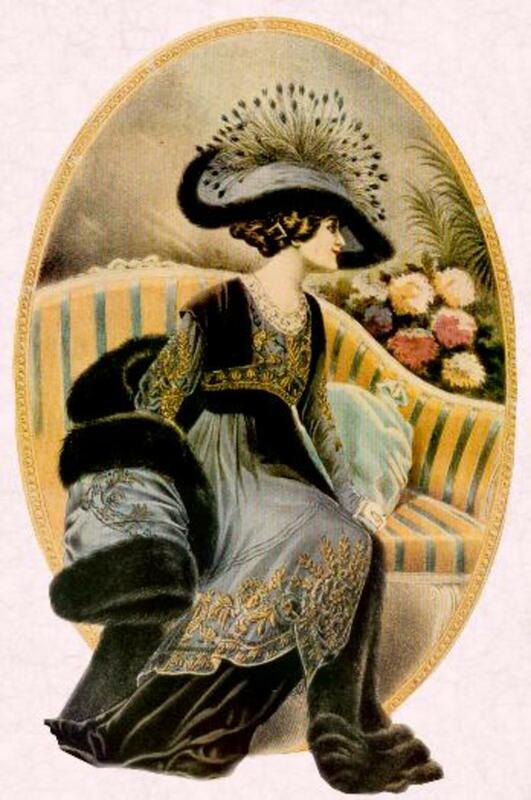 The lampshade tunic came into vogue toward the end of Edwardian times as did the Directoire style of 1912 (as pictured at the top of this article) which featured a high waist that accentuated a long, slim figure. Turbans and jeweled slippers were a feature of Orientalism and a new exotic style of dress for Edwardian women. But, the Great War (World War I)put an end to extravagant trends as the world turned to a war economy with shortages of fabric and leather, and the more austere fashions usually dictated by the privations of war. I am building an Edwardian period model railway. Could you please suggest colors for the clothing of these figures? The colors used for Edwardian clothing will differ according to the season, the occasion, time of day, etc. Take a look at fashion plates of the period, concentrating on the types of clothing your figures are wearing. Are the figures at the station? Then you want to look at traveling clothes. 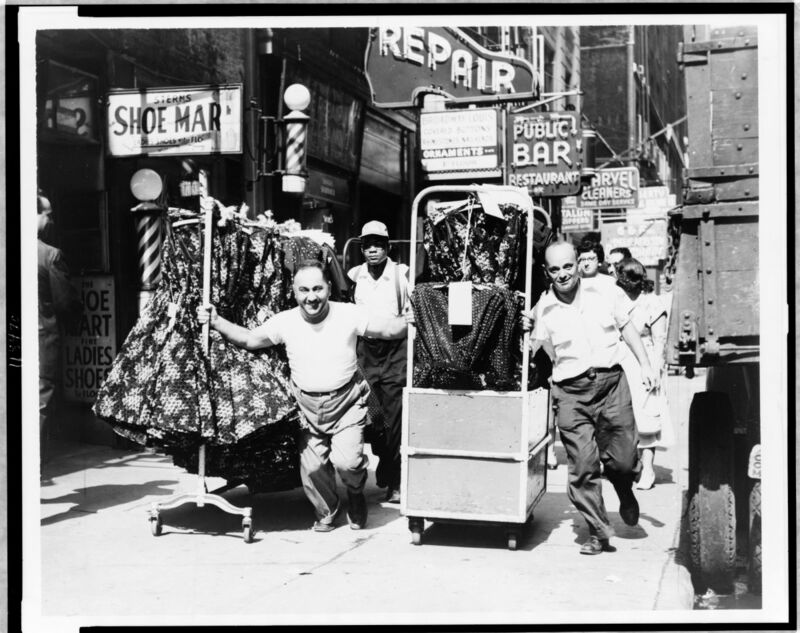 If they are shown walking down another street, look for walking or afternoon clothes. Is the Belle Epoque also known as the Edwardian era? You can try several types of sources. Look at fashion histories or encylopedias that encompass a longer period of time, but zero in on your time period. Contact a university or a museum who may have available resources or may be able to recommend some. The Victoria and Albert Museum in London has a huge collection and maintains an archive pertaining to historic fashion and textiles. You may also want to just check around using a variety of key words. For instance, I found a book called "Life Below Stairs True Lives of Edwardian Servants" by Alison Maloney. Also "Pocket Guide to Edwardian England" by Evangeline Holland. You may also read more general books about the time period like "The Edwardians" by Paul Thompson. Many books about the period offer information on how working people lived and dressed. When you say you have a school project, I am not sure what you mean. 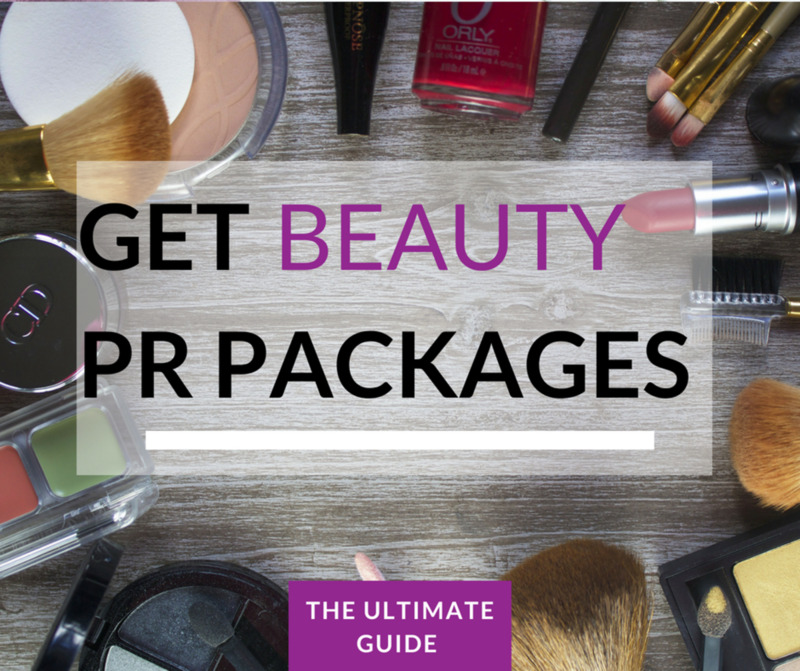 The information that you seek will differ depending on your level. Don't be afraid to ask your instructor for sources. You can also ask a librarian to help you. Good luck! Hello, I am trying to do a school project on British Clothing During from 1901-1910 of the Edwardian era. It is a lot of information that I need but I can't seem to find any specific information. If you could point me in the direction where I could find info on Lower Middle Class Men's British Edwardian Era clothing, that would be great. Thanks! Hi Margaret - despite the idea that hemlines were cut in stone, women wore various lengths throughout the 20th century. Remember that older women often cling to the hemlines of youth. Why don't you Google image the time you think this photo represents and see what the ladies of the day are wearing. 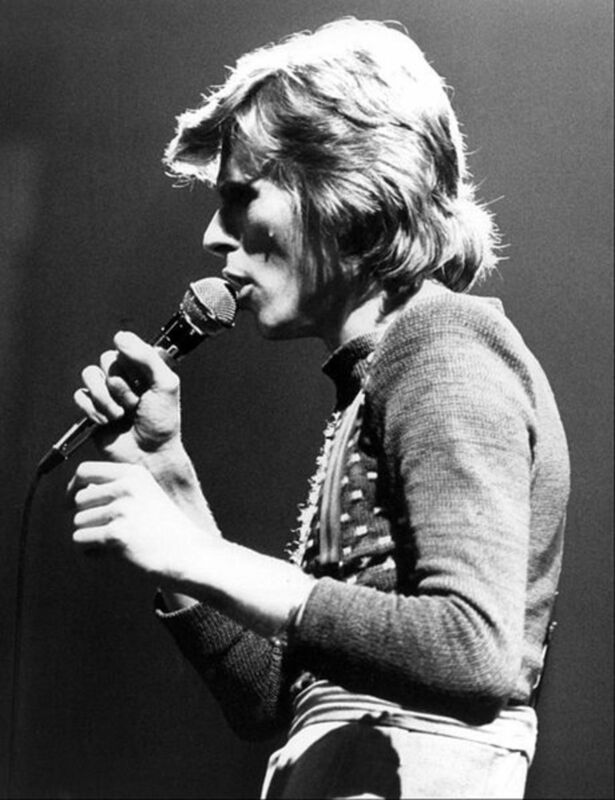 Look at the cut and style, sleeves, neckline, width of skirt, etc. Also check out hair and background. I have seen improperly dated photos in books! This sounds like a fun project. Hello, I am trying to date an old family photo by the fashions/hairstyles to help me identify the people in it. One woman in the background is wearing a dress that is about at her ankles, not to the ground. Am I correct that this would date it about 1910 or so? Love this page! I love this article as I am writing a non-fiction book on time travel and my first era is the Edwardians!I give you a lot of credit for the useful information and pictures!thank you! Hello! I'm writing from Argentina and I wanted to thank you for this precious post! I have been investigating about the Victorian-Edwardian transition period for almost three years and this is the first time I find an article not only extremely useful, but also organized and written in a serious and professional way. I really thank you from the bottom of my heart! Anne Harrison - yes, and a real lady probably changed her clothes several times a day - tea gown, walking suit, dress for dinner, etc. Thanks for reading! Hi, HJ - the concept of women wearing trousers was also introduced during the Edwardian period. Harem style pants were shown with tunic tops. 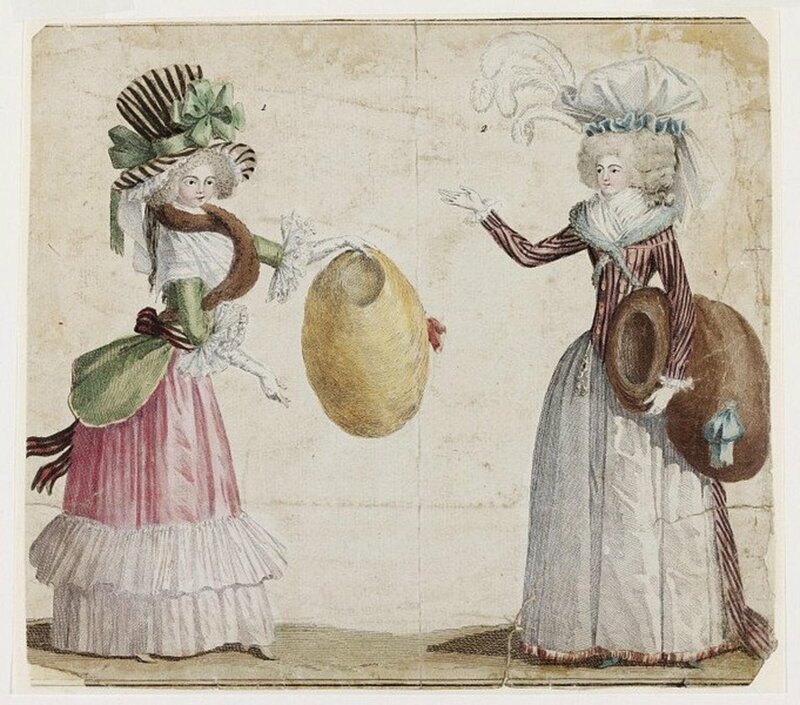 Earlier, bloomers had been introduced for women to wear for sports and cycling, but the idea did not go over very well. Thank you for your interest. Good luck with your project. I think the debate was women wanted to to change their fashion like shortening their dresses etc. But Thank you so much for the failures! Please let me know if you know more! thank you! Hi, HJ - what debate? Are you talking about the business with the health corsets? Or the difference between the looser, peasant styles and the stiff, pigeon look? Some of the new looks that were introduced failed, but popped up again in later years. For instance the bob haircut was an Edwardian flop, but became all the rage in the 1920's. This is a great article and I love the pictures! But I am doing a project on the Fashion Debate in the Gilded Age and I need to know the failures of the debate as well as successes and consequences. Your hub has helped me with successes but I REALLY need the failures. Please help! Thank you! dpatullo - yes, they sure do. I guess designers come to appreciate ancient fashions; the 1914 dress pictured above looks ancient as they come. And so many times we've seen glimmers of older looks. Thanks! I feel the ancient eras fashion is repeating again. In 2010 collections, many designers had copied the previous eras designs. Nellieanna - Good to see you! I think that Edwardian fashions were so pretty! Not too crazy about the corsets or the stupid looking monobosum, but late Edwardian is so Bohemian! I wonder if you have created a hub about those fashion illustrations - they sound just beautiful! I love those earlier fashion periods. In fact I have several antique "Godey's Lady's Book" prints which my mother gave me, framed on my bedroom wall. They are somewhat sooner than the Edwardian period, but very delightful. 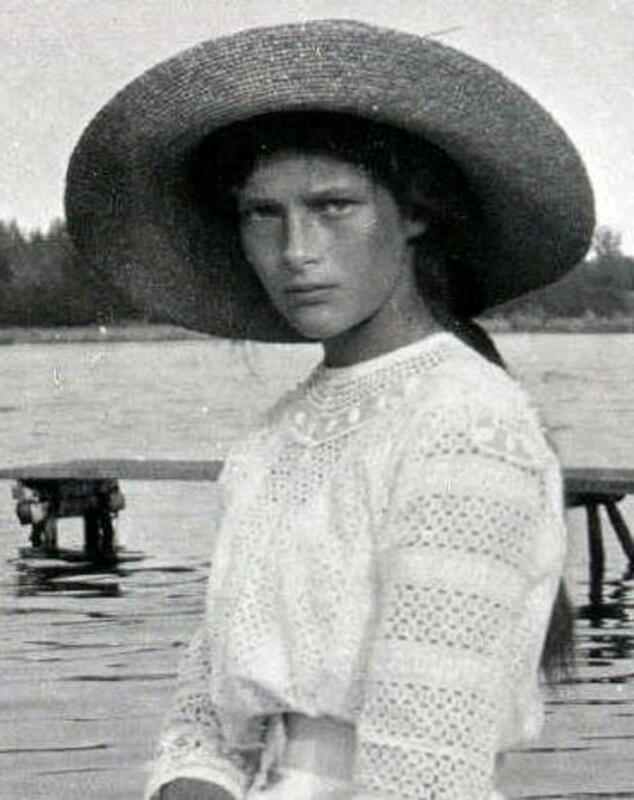 She herself was part of the Edwardian era, born in 1892. And I also have a fantastic set of original watercolor 1930s fashion illustrations, some even with actual fabric swatches. My sister found those for me, knowing my love of fashion. These were sent out from Marshall Fields in Chicago to an actual customer in Waco, Texas in 1936 (the letter accompanied them) - for her selection. Prices are on them in pen and ink. They are quite amazing. I love your hub! I am bookmarking it and voting it UP! And I agree that the corsets were not all that appealing. My mother would have attested that ironing the frills and trims with flatirons was no picnic, either. LOL. She did that for her classmates to earn her way through college!